Consolidated B-24D Liberator Bombers are repaired at the Ogden Air Depot at Hill Army Air Field. Ogden was charged with repairing combat and training damage to aircraft including the Boeing B-17 Flying Fortress (starting in April 1942), B-24, Boeing B-29 Superfortress, Curtiss P-40 Warhawk, North American P-61 Black Widow, and Douglas A-20 Havoc. Women's Airforce Service Pilots (WASPs) and United States Army Air Force and civilian male pilots would ferry the damaged aircraft from receiving centers on both coasts to Ogden, where major reconstruction took place around the clock. Ferrying was dangerous and tiring work, and many pilots were injured or killed when the planes broke up in the air, on takeoff or landing. 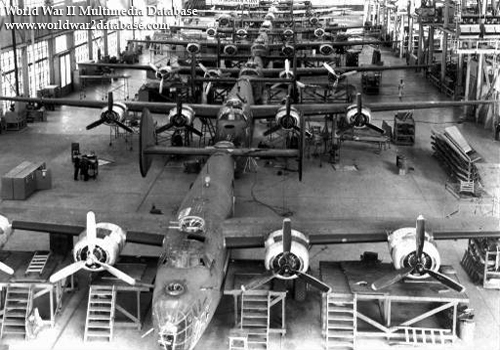 This large assembly line repair for the B-24s started in February 1943. These war-weary aircraft are receiving new engines and other modifications. Recently, Hill Air Force Base acquired a B-24 for restoration for its museum.